How Do Electricians Use Trigonometry? What Are the Functions of a Current Transformer? You can always tell the difference between a true professional and a hack. A professional is proud of his work, and people admire it. A hack doesn't care, and its obvious his work is substandard. 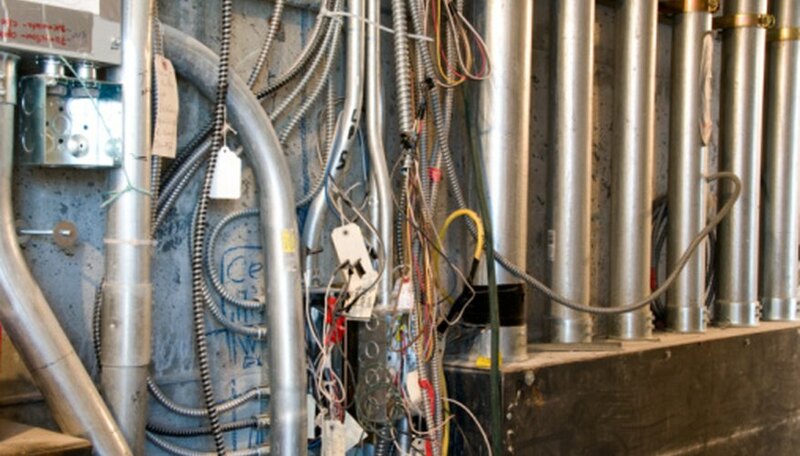 When it comes to conduit bending and cable tray running, a hack job may not even pass inspection. Avoid being labeled as less than honorable by doing it right the first time. The most basic premise is to follow code. Codes vary from municipality to municipality. Familiarize yourself with local codes before doing any work. For example, a stipulation might be a conduit cannot be filled more than 75 percent. Don't break code by stuffing wires into the conduit, but rather use a larger size conduit. Another code may stipulate a minimum radius of 12 inches. Do not bend the conduit any less then the radius specified by code. If your work does not pass inspection, you will have to tear it apart and start over. Save yourself all the hassle by doing it right the first time. Take-up is the shrinkage that a conduit develops in the radius. Bender gain is a stretching effect the bender puts on the conduit. Any hack can bend a piece of conduit, and trim it to fit. A professional calculates the take-up and gain, and bends the conduit to fit perfectly. Take-up tables are available to reference back to. For example, the take-up on a piece of 3/4-inch EMT (also called "thinwall") is 6 inches. The gain is 3 1/4 inches. You have to lay out the boxes, and by using a complex series of steps incorporate the the take-up and gain in your calculations. After calculating out the equations, mark and bend the conduit. Conduit bending is an art that is only developed by practice and experience. Every time you bend an offset, the conduit loses length. Tables tell you how much loss happens for different offsets. Suppose you have to bend an offset to mate the conduit to a junction box. Measure the offset to determine how much is lost. Suppose you have to offset 3 inches. For an offset distance of 6 inches, with 30-degree bends, the conduit loses 3/4 inch of length. You have to calculate the offset loss before cutting the conduit. Cable trays are like conduit, except they are square and have an opening top. The first common sense rule is to follow code for cable trays. This includes not stuffing the tray full of wires. For example, if code specifies only a 50-percent fill, use a larger tray that allows more leeway instead of a smaller tray. You may have to add in wires later on. If so, anticipate the future by not having to change out the tray as well. .
Never intermix low and high voltage wires in conduits and cable trays. Several reasons exist why you should not. First, transformer effect is very powerful. Whenever a high-voltage wire starts or ends carrying current, a strong magnetic field develops or collapses. This field induces an aberrant voltage in a low voltage control wire laying next to the high voltage wire. This aberrant voltage is read by the controllers, and in essence a false input signal generates a false output command. Another reason you should never intermix wires is chafing. Wires may rub a little bit, due to vibration. Over time, the insulation chafes through. If a high voltage line sends a high voltage pulse into a low voltage control wire, bad things happen such as controllers exploding. Wire chafing was also suspected as the cause of an F-16 fighter jet crashing in 1982. Oldhand, Tony. "Common Sense Conduit Bending & Cable Tray Techniques." Sciencing, https://sciencing.com/common-bending-cable-tray-techniques-7960670.html. 25 April 2017.